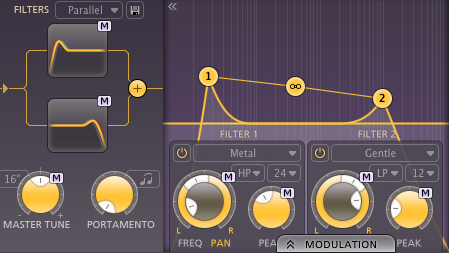 The FabFilter Twin 2 subtractive synth may be the most underrated of all the plugins in the FabFilter collection. 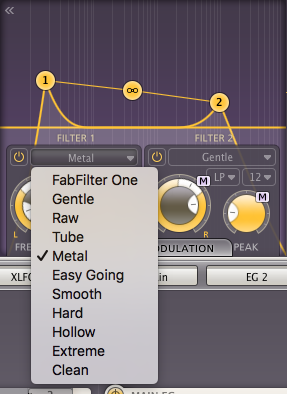 Admittedly, I’m a big fan of the FabFilter plugs in general and find their sound to be top-notch and their GUIs elegant. 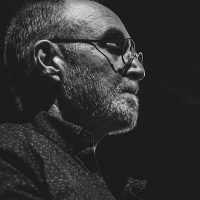 If you haven’t tried them, I suggest also looking at the Pro-C, Pro-Q 2, Pro-R, and Saturn (FabFilter tutorial playlist here). 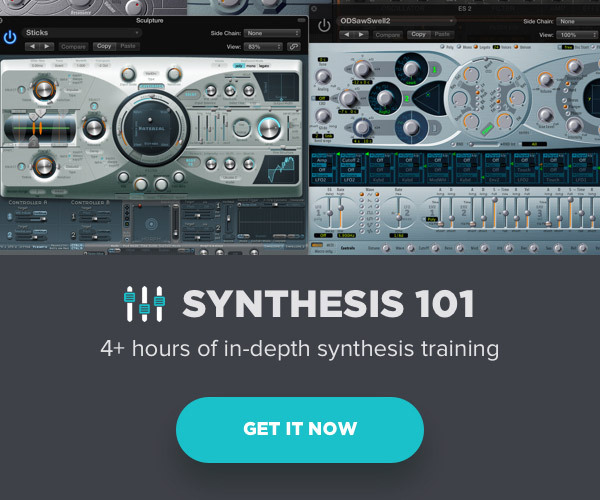 Since I’ve been writing a lot about synthesis lately and just released my Synthesis 101 course, I thought I’d take a deeper look at the FabFilter Twin 2. The sound generation section includes three oscillators with all the basic wave shapes plus white and pink noise generators. 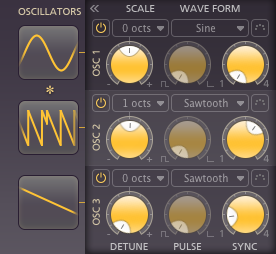 You have easy access to tuning and wave shapes by clicking on the waveform icon itself and dragging either vertically or horizontally. Using key modifiers like the command or shift keys will change functionality and everything is described explicitly with well-conceived mouse-over pop-up hint windows (which can be toggled off as well). The Filter Section provides two multi-mode filters (LP, HP, BP) with adjustable slopes (12, 24, 48) and adjustable routing (serial, parallel, per osc). There is a “Filter Characteristic” menu that seems to add various flavors of distortion. You can adjust the cutoffs independently or move them together by dragging the link icon in the interface. The Main Amplitude Envelope is displayed and adjustable in the top signal path window, as well as in the Modulation section, which makes sense. As with most synths, one of the envelopes is hardwired to amplitude, but can also be used to modulate other parameters simultaneously. This is not always obvious to the first-time user, but it’s quite clear in the Twin 2. 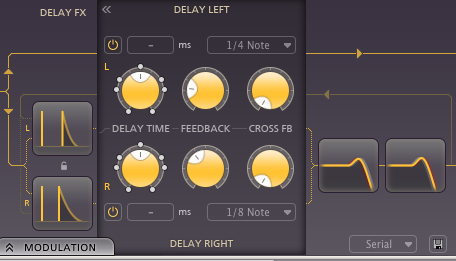 The Delay FX Section is powerful enough to be its own plugin. 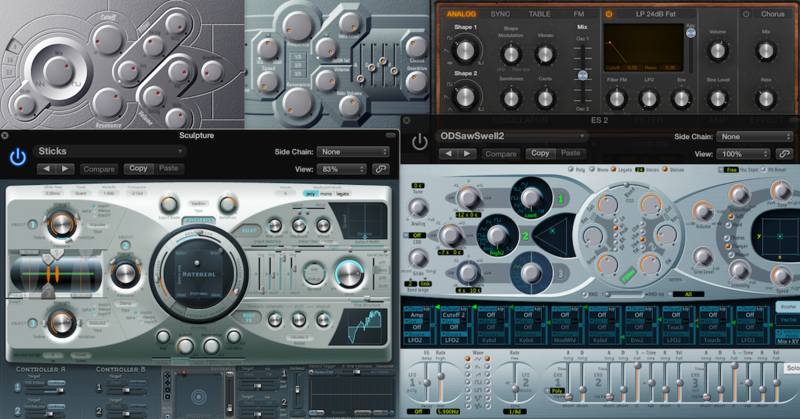 The benefit of having effects in the instrument itself as opposed to external plugins, is that the effects stay with the preset. 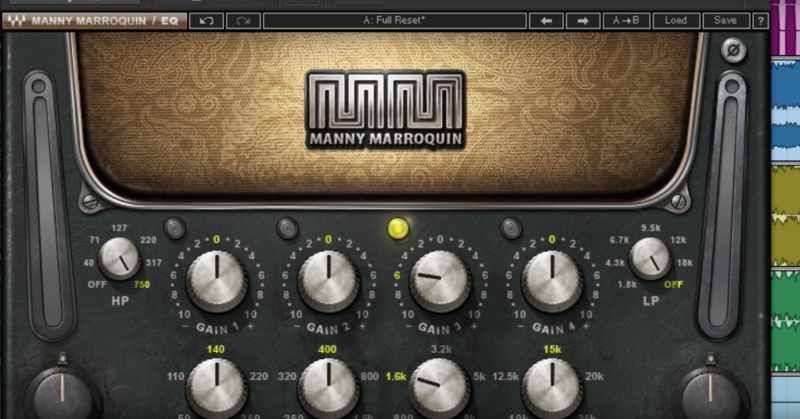 So you don’t have to duplicate effects chains in other sessions to get the same the sound. The Delay section in the Twin 2 allows for stereo delay, cross feedback, sync or free settings, two delay filters (identical to those in the dedicated Filter Section mentioned above) and variable routing between delays and filters (serial, parallel, per delay). Again there are plenty of click and drag key options that enable fast and intuitive control. The Output sections give controls for Dry and Wet level and panning. The XLFOs are particularly attractive. 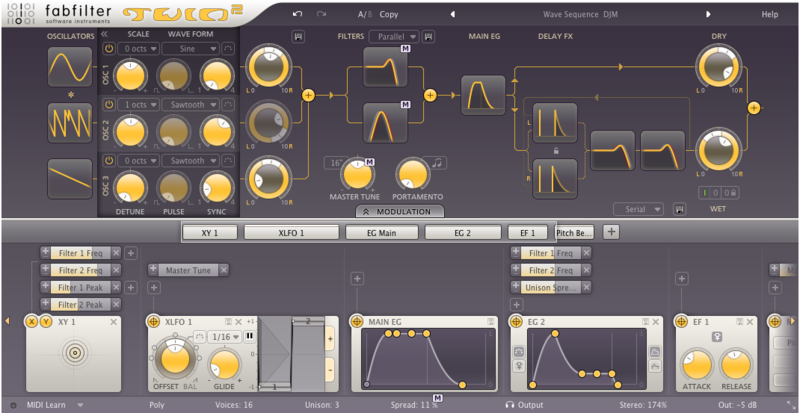 They offer some unique possibilities in terms of LFO shapes, including up to 16 step sequence points, predefined rhythmic beats, and a heartbeat among others. Each point in the LFO is movable and you can add new points after a shape is created making this an extremely versatile modulator. Connecting a source modulator to a target control is a simple matter of clicking and dragging from the icon in the upper left of the modulator to the parameter you want to modulate. This creates an instant routing connection and an appropriately labeled intensity control, directly above the modulator. The Modulation Display section can be replaced with a Keyboard Display with Bend and Mod Wheels for experimentation and auditioning purposes, if you don’t have a controller accessible. There is a nice catalog of Preset sounds intelligently organized, as well as a menu for Delay presets. 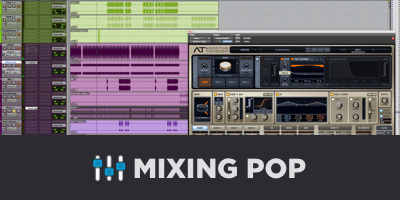 In most cases, clicking and dragging on a waveform or envelope will directly affect it, and double-clicking on it will expose additional controls for tweaking. Global controls include polyphony and voice settings (1 – 32 voices). You can also choose the number of Unison Voices independently, and using the Unison Spread Parameter, they can be detuned relative to each other. Last are stereo spread control, master output and panning controls. Lastly and most importantly, this thing sounds great! I encourage you to check out the 30-day trial and give it a spin. I’m throughly impressed with this deceivingly simple subtractive synth. Currently priced at around $150, I think it’s a must-have for any synth arsenal. 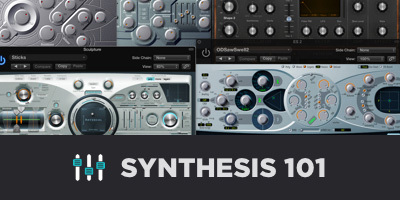 If you’re new to synthesis or just want to deepen your knowledge and fill in some gaps, check out my new course called Synthesis 101, available exclusively on The Pro Audio Files.